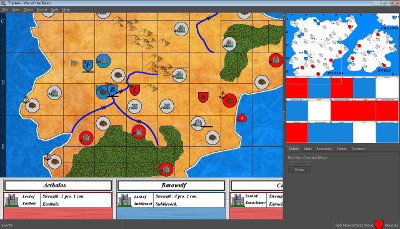 The War of the Relics is complex medieval-themed strategy game in which two players build factions of noble lords who use powerful titles and offices to gain strength and crush the opposition. Each lord can recruit sworn troops, mercenaries, druids, and ships to his cause, taking over castles and towns via title or conquest. Three sacred relics must be gathered to a player's faction to anoint one of its nobles as the new king. A system of random events can thwart the best-laid plans at the most inconvenient times.